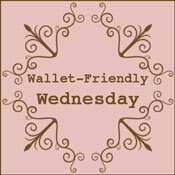 Welcome to another Wallet-Friendly Wednesday! This link party is an opportunity to share your latest bargain shopping finds, money-saving ideas, thrift store outfit deals, DIY projects, budget home-improvement projects, side-of-the-road finds, consignment shop steals, upcycle projects, home organization tips, etc. . . ANYTHING you've done that's saved you money. Use your imagination! Share whatever you've done to save money recently! Grab the Wallet-Friendly Wednesday button at the top to include in your post. Please only list family-friendly links--and no Etsy or advertising links, please. Once you've linked your project, be sure to visit the other projects and leave comments! to my ONLINE-ONLY Pampered Chef Show! Shop anytime, anywhere, at your own convenience! The show runs through Saturday, 8/25, and you can earn fabulous FREEBIES (like the cutting mats above) with qualifying purchases! Come one, come all! See the Facebook event Leslie's Pampered Chef Party ON-LINE ONLY!!!! for more details! I love seeing the bargains people get at thrift stores...here are some from THRIFT & SHOUT! I also shared my very own DIY toothpick container tutorial! Hi Leslie! Thanks for the mention! I'm linking up with you today! Yay! There's still time--ONLINE Pampered Chef Show!